Thank you to the good folks over at Detours Bags. I now have a fourth Detours Bag. Yes fourth! I have paid for three of them in the past. Today I spoke to them about my race plans for Trans Iowa and how pleased I have been with their other bags. It came as a complete surprise when they offered me a bag for my race. YOU NEED TO CHECK OUT THE QUALITY OF THESE BAGS! My personal experience with Detours bag began in late January on the San Diego 300km Brevet. On that event, Brandy and I used the Hightail on our tandem and were able to fit so much stuff in the bag that we were amazed. We were also very amazed at the quality of construction, weatherproofing (also comes with a rain cover) and the zippers. There we were the two of us tugging at the zipper and squeezing the bag and tugging at zipper to stuff all our clothing in the bag. The quality of these bags is without peer and the zipper is REALLY tough. The finger loops are a nice touch. You can tell these bags were designed by people who ride! The full enchilada for Fast+Light Touring. From your first Fundraiser Century to springtime B+B hopping in Arizona, this puppy will hold your essentials and swallow the extras. It’s the Big Bro of the HIGH TAIL. The EXP denotes the mid-riff expando bellows that considerably increases this bag’s volume . Meant to carry extra clothing on credit card tours or committed all day on or off-road rides. Simple-to-use, German-engineered KlickFix seatpost attachment. Only a small plastic adapter stays on the bike after you remove the HIGH TAIL EXP. Waterproof bottom and top lid. Elastic gear spider on top lid. It’s easy to share the HIGH TAIL EXP with your other bike when you buy another seatpost adapter. 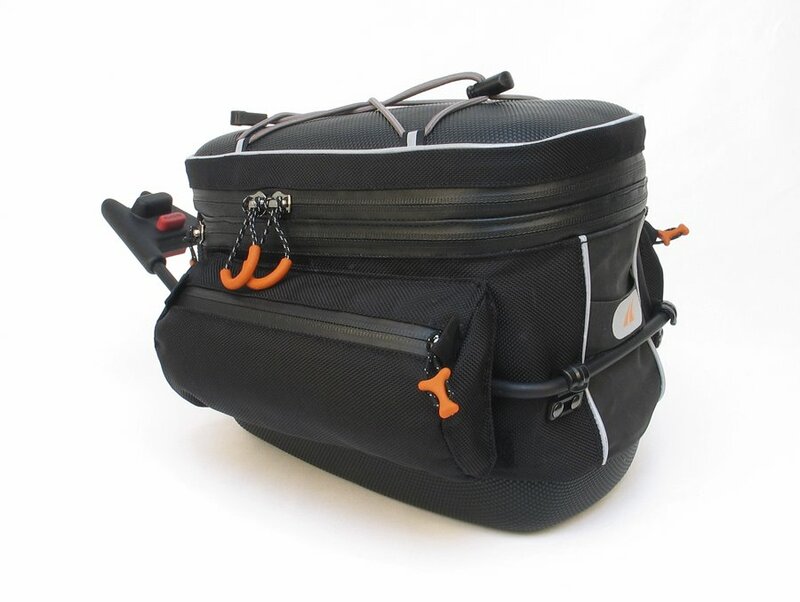 MAX LOAD 5 lbs – the seatpost adapter is plastic, not reinforced concrete – overloading the bag can cause the adapter or frame connector to break – particularly on bumpy off-road adventures. The extra large capacity of the EXP model is meant to accommodate bulky, but lightweight items such as extra clothing – not a six pack of your favorite microbrew. WARNING: Do not use the HIGH TAIL EXP and its adapter on a CARBON SEATPOST. Failure to heed this warning could result in serious injury or death.